The "Arbeitsgruppe Rechnersicherheit" (AGRS) consists of interested students as well as scientists and business experts. The workgroup came to life as an initiative following the course "Sicherheit in Rechnersystemen". 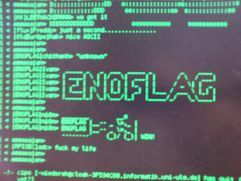 The key interests of the group are the discussion of recent political as well as technical developments (at the weekly meetings) and the participation in international security contests under its pseudonym "ENOFLAG" or its alias "LEGOFAN". The group is led by the communication and operating systems chair (KBS) and has successfully taken part in more than 25 contests during the last seven years. The group meets on Tuesdays 6pm in room EN361 (new room!). Visitors are always welcome. There are currently no CTFs planned. We meet 1h in advance in the room EN458. The Tuesday before each CTF is the preparation meeting. In Summer term 2014 we will again start to work on an own CTF. It will be organized as a project/seminar module for Bachelor and Master students.